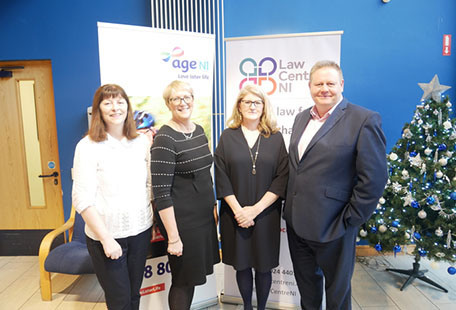 The Law Centre NI and Age NI organised a Roundtable on Adult Social Care (12 December) to bring together experts in social care, including policy makers, commissioners and experts by experience. The purpose was to provide an opportunity to take stock and consider, one year on, progress made in taking forward proposals made by the Expert Advisory Panel on Adult Care and support in its report: Power to People: Proposals to Reboot Adult Care and Support in NI. a developing a care system that is adequately resourced and sustainable. We recognise that the absence of the NI Executive and a Minister presents a challenging context for the transformation of social care. We believe that participation in the Roundtable demonstrates a clear desire to bring about change in social care. However, it's important to recognise that there are local examples of good practice which are already delivering the change we all want to see. We are calling on the Department, commissioners, providers and people who use or work in social care to start a public conversation about the role and value of social care and how we adequately resource high quality care and support in Northern Ireland.